FoodThoughtsOfaChefWannabe: Chocolate Chip Cookie Muffins! I must admit I have created some great muffins. You should check them out. Well my husband created the Blueberries and Cream Muffins but, other than that. There is no bad time for one. Breakfast, brunch, lunch, snack, dinner, and in this case dessert even!! I don't know if a recipe could be any easier. Through stuff in the bowl, mix and bake. Right? 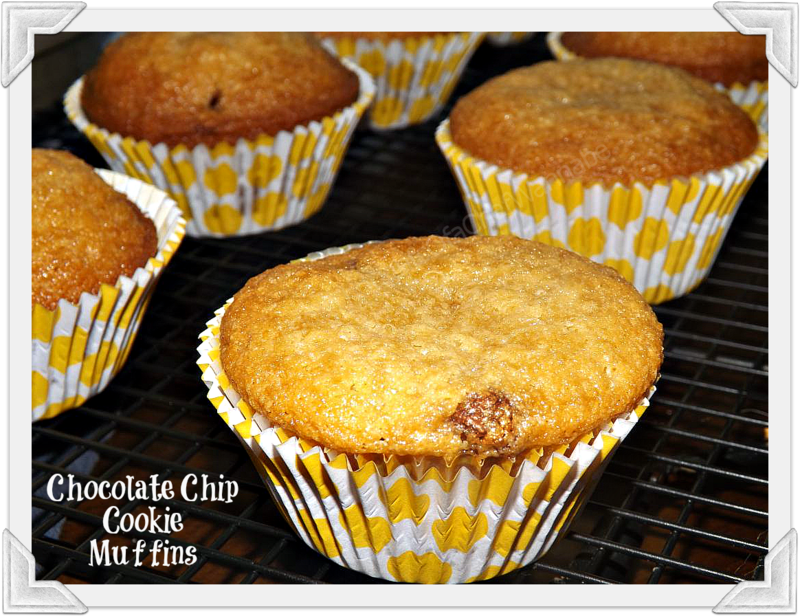 These muffins taste like the softest, chewiest chocolate chip cookie you have ever eaten. I am just warning you , don't think you will stop at just one. No, really, I am serious. In fact I noticed they LOOKED a little plaine Jane, humdrum and boring. These babies pack a flavor and texture you won't soon forget. I promise! You will notice an odd ingredient, or not so odd, just different. 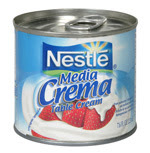 It is the Nestle's Media Crema Table Cream. Here is a photo of it. You will find it either in the Mexican Food aisle at your store, OR near the evaporated and sweetened condensed milk. Preheat your oven to 375 degrees. Spray a muffin tin with nonstick spray. I find liners hard to remove from muffins alot so just forget about those babies! I put them in liners when they come out for serving. If you are using a stand mixer, just use that bowl. Otherwise in a large bowl add in flour, white sugar, brown sugar, baking powder, baking soda and salt. Mix to combine. Then add in oil, crema, and egg. Again mix just until combine, don't over mix! Pour in chocolate chips and give it one more mix! Bake for 16=18 minutes. 17 minutes was perfect for mine. This will make 12 regular muffins. Make sure to cool COMPLETELY before removing from pan. I hope you try these bites of heaven. I am serious, this is completely unbiased...HA! I have NEVER tasted chocolate chip muffins this good. P.S. Before you even ask, YES you COULD replace the Media Crema with milk, 1/2 cup. But it won't be nearly as amazing and it is cheap to buy. You could possibly find it in the Mexican food aisle at your grocery store as well! That's it. I may have to UNsubscribe from your emails. Every time I open my inbox I gain weight. lol These look YUMMY!!! These are awesome, like fluffy chocolate chip cookies.